We introduce three metrics for measuring the performance of the Philippine scientific enterprise system consisting of organizations in the country that are directly involved in the generation of new scientific knowledge and in the training of future Filipino scientists and researchers in STEM. The national budget in 2014 was 1.59 times larger than that in 2009 consistent with the steady GDP growth during said period. Consequently the budgets for SUCs and the DOST also grew by 61.53% and 115.11%, respectively. We consider peer-reviewed technical publications and PhD graduates as tangible outputs of an institution that is engaged in scientific R&D activities. The metrics are: Academic Productivity Index (API), Science Productivity Index (SPI), and the PhD Production Efficiency Index (PPEI). The API score is given by the ratio of the (geometric) product of the number of publications and PhD graduates produced in a given year, and that of its corresponding budget allocation and number of faculty members. The SPI score is computed as the ratio of the product of the number of publications and PhD graduates, and that of the number of faculty members and their time to do research. Equal importance is given to institutional PhD graduates and the individual (peer-reviewed publications) outputs. Because the outputs are calibrated to the corresponding inputs an index score would track the response (absorption capacity) of an institution to temporal variations in resources invested into it. Scientific measures that align institutional output with individual performance are recommended in faculty and staff promotion as well as in the selection of R&D administrators and in assessing the possible impact and consequences of budget increases and policy initiatives. Prudent application of data-driven analytics promotes transparency, predictability, efficiency and fairness. It motivates stakeholders to work together for a common purpose that is larger than the sum of their own individual aspirations. Caesar Saloma is a Professor of the National Institute of Physics (NIP) and Scientist III at the University of the Philippines Diliman and a member of the National Academy of Science and Technology. He previously served as the Director of the NIP, Dean of the College of Science, and Chancellor of the University of the Philippines Diliman. The International Commission for Optics has recognized his contributions in the field of optics through the conferment of the Galileo Galilei Award in 2004. He has also received the Metrobank Foundation Outstanding Teacher Award (2007) and the Presidential Lingkod Bayan Award (2008). In 2008 the ASEAN Committee on Science and Technology awarded him with the triennial ASEAN Outstanding Scientist and Technologist Award in recognition of his contributions to photonics and signal processing. C. Saloma. 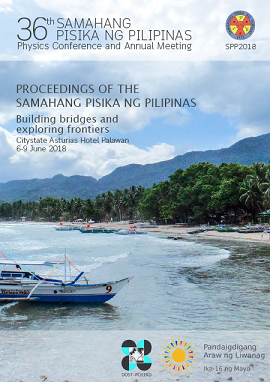 Measuring the performance of the Philippine scientific enterprise system, Proceedings of the Samahang Pisika ng Pilipinas 36, SPP-2018-INV-1A-01 (2018). URL: https://paperview.spp-online.org/proceedings/article/view/SPP-2018-INV-1A-01.